44 Commonwealth is located on the south side of Commonwealth, between Arlington and Berkeley, with 42 Commonwealth to the east and 46 Commonwealth to the west. 44 Commonwealth was built ca. 1864, one of two contiguous houses (42-44 Commonwealth). 44 Commonwealth was built as the home of Royal Elisha Robbins and his wife Mary Elizabeth (Horton) Robbins. They previously had lived at the Evans House hotel. Royal Robbins purchased the land on which 44 Commonwealth was built on April 29, 1863 from Franklin Havens. It was part of a larger parcel originally purchased from the Commonwealth of Massachusetts on May 2, 1860, by shipping merchant and US Congressman Samuel Hooper. He and his wife, Anne (Sturgis) Hooper, lived at 27 Commonwealth. Click here for an index to the deeds for 44 Commonwealth. Royal Robbins was an importer of watches and a principal organizer of the Boston Watch Company, which began manufacturing watches in Roxbury in 1853 and later moved to Waltham. In 1857, he moved to Waltham to oversee and expand the watch manufacturing business. After the Civil War, the business was reorganized as the American Waltham Watch Company; his firm, Robbins, Appleton & Co., were agents for the company. The Robbins’s children lived with them at 44 Commonwealth: Royal Robbins, Mary Everett Frances Robbins, Gertrude Robbins, Reginald Chauncey Robbins, Marjorie Robbins, and Phyllis Robbins. Royal Robbins married in November of 1888 to Theresa Huntington. After their marriage, they lived at 375 Beacon. Royal Robbins was treasurer of his father’s firm, Robbins, Appleton & Co.
Gertrude Robbins married in September of 1894; after their marriage, they lived in New York. 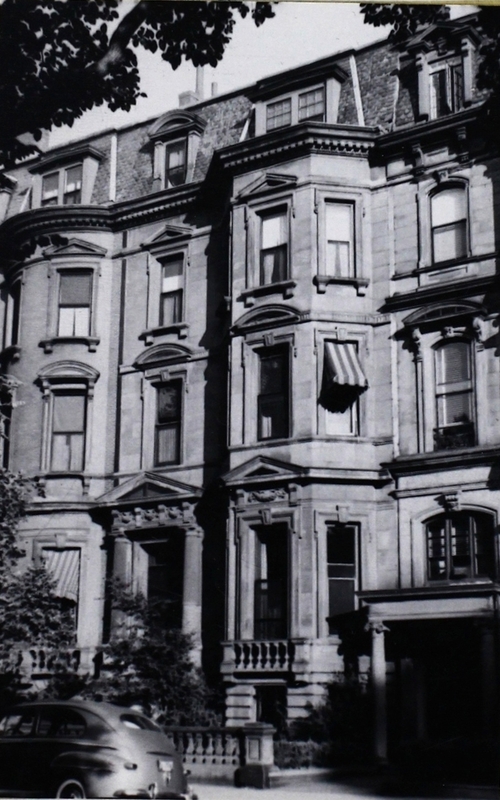 In about 1895, Royal and Theresa Robbins joined his parents at 44 Commonwealth. They had lived at 341 Marlborough during the 1894-1895 winter season. Mary Elizabeth (Horton) Robbins died in March of 1896. 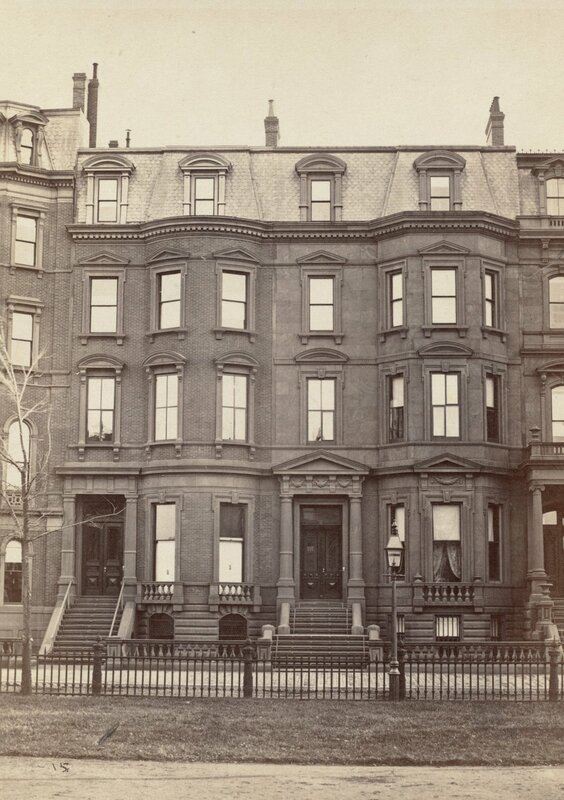 Royal Elisha Robbins continued to live at 44 Commonwealth and also maintained a home in Beverly. Royal and Theresa Robbins continued to live with him, along with Mary, Reginald, Marjorie, and Phyllis Robbins. By the early 1900s (and probably before) they were joined by his wife’s sister, Miss Frances E. Horton. 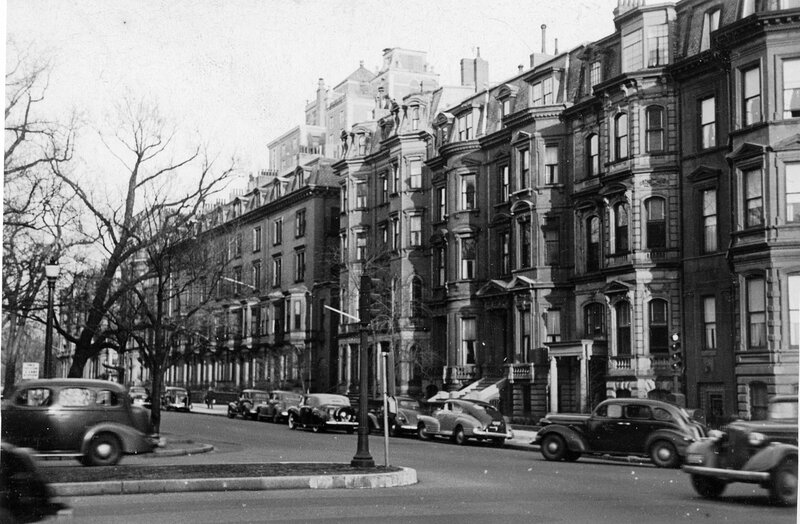 In about 1901, Royal and Theresa Robbins moved to Brookline. Marjorie Robbins married in January of 1902 to Albert Goodsell Milbank. After their marriage, they lived in New York City. Royal Elisha Robbins died in July of 1902. 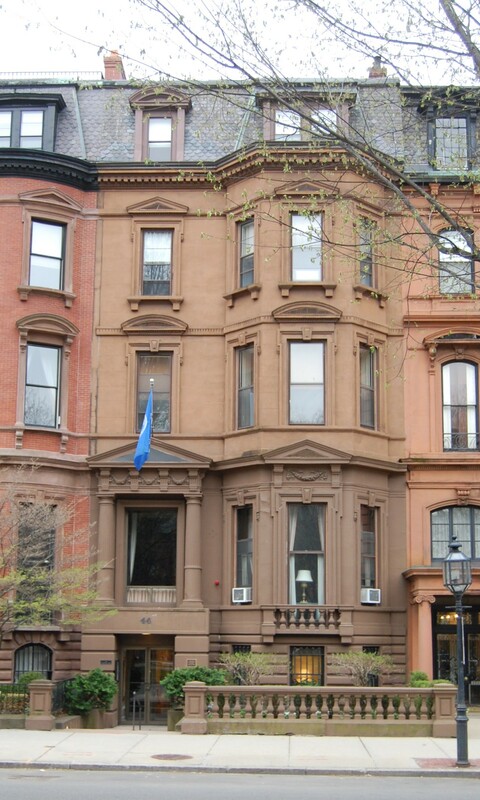 After his death, 44 Commonwealth remained the home of Reginald and Phyllis Robbins, and their maternal aunt, Frances Horton. Mary E. F. Robbins appears to have moved to Lynn. On November 9, 1905, Reginald and Phyllis Robbins purchased 44 Commonwealth from their father’s estate. Reginald Robbins married in April of 1907 to Jane Hall. 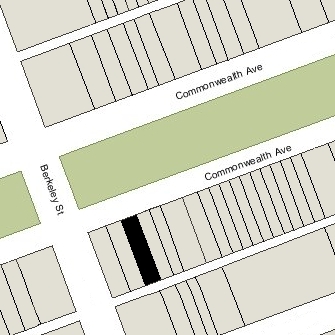 After their marriage, they lived at 44 Commonwealth and maintained a second home in Hamilton, which became their primary residence after about 1910. He was an executive with Robbins, Appleton & Co.
On August 15, 1910, Phyllis Robbins acquired Reginald Robbins’s interest in 44 Commonwealth. She continued to live there with Frances Horton. On June 30, 1925, the College Club purchased 44 Commonwealth from Phyllis Robbins. The Club already was owner of 38-42 Commonwealth (it had acquired 40 Commonwealth in 1905, 38 Commonwealth in 1910, and 42 Commonwealth in 1919). After selling the house, Phyllis Robbins and Frances Horton continued to live at 44 Commonwealth until Frances Horton’s death in August of 1927. Phyllis Robbins moved to an apartment at 5 Arlington soon thereafter. In October of 1928, the Club applied for (and subsequently received) permission to cut through openings in the party wall between 42 Commonwealth and 44 Commonwealth. In 1974, the College Club sold 38-40 Commonwealth and 42 Commonwealth, and consolidated its organization in 44 Commonwealth. In April of 1974, the College Club applied for (and subsequently received) permission to remodel 44 Commonwealth, including lowering the front entrance to street level, and to confirm the legal occupancy as one apartment and twelve lodging units. 44 Commonwealth remained the College Club in 2015.